The Epson TM-C3400 SecurColor printer is the first inkjet printer to specifically address the needs of health care organizations and their color printing challenges. It can produce thousands of colors on demand, accept a range of durable media from 1.2 to 4.4 inches wide, offer user-selectable resolution of up to 720 dpi and support leading barcode formats. SecurColor also comes with USB 2.0 and Ethernet interfaces to connect to existing information systems. 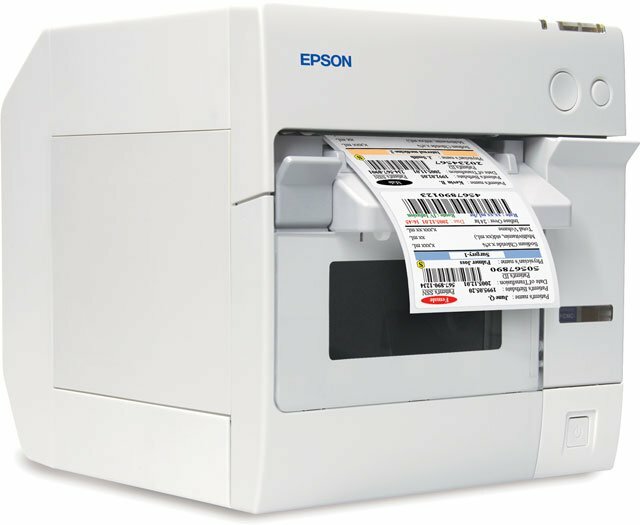 Epson continues to work closely with industry-leading partners to ensure that the label and paper media approved for SecurColor meets all the stringent requirements of health care regulations. TM-C3400-011, SecurColor Inkjet Printer, selectable print resolution, Ethernet interface, power supply included. Cables not included. See accessories. TM-C3400-LT, ColorWorks Label Terminal. Includes SecurColor Inkjet label printer and integrated 12.1 inch XGA TFT color LCD touch panel. 6 USB ports for additional devices on-board, no PC connection, keyboard or mouse is required. Call for more information. TM-C3400-011, SecurColor Inkjet Printer, selectable print resolution, USB interface, power supply included. USB cable not included. See accessories. We require this specific printer for an application. It is adequate to the task. USB-5020 Printer Cable (6 feet, USB 2.0, Black, A to B Cable). Replaces (Part# USB-5020-02M). MATTE SYNTHETIC INKJET LABEL, 3" x 90', 2" outer diameter, 12 rolls/case, CONTINUOUS. 4" x 75' Paper 4.6 mil inkjet label. Continuous. Single roll. Custom item. Please call for pricing. SJIC15P ink cartridge for SecurColor printer. Three Color. Single Pack.